I noticed it as I sat in meditation before worship. 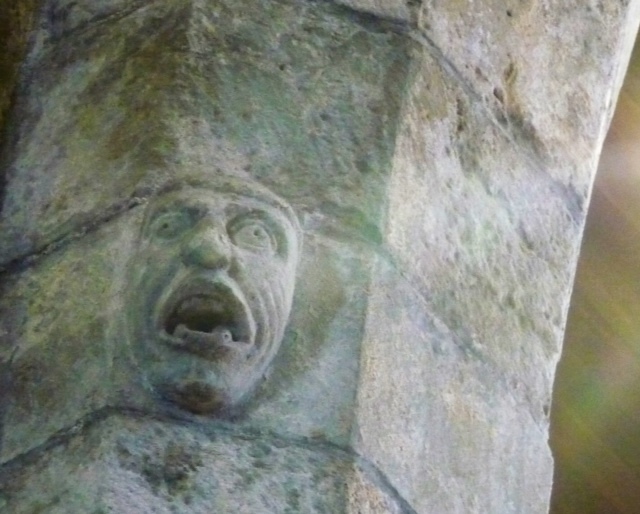 High on a pillar of the restored medieval Benedictine Abbey at Iona was a stone carving of a man with his eyes and mouth wide open in surprise. I had just arrived on the island of Iona in the Inner Hebrides of Scotland and was living in community for a week with 45 people from different countries. The Abbey is the home of the Iona Community, an ecumenical dispersed community that is committed to seeking new ways of living the gospel in today’s world. Central to life at the Abbey is morning and evening worship, which draws thousands of visitors from all over the world every year. The Iona Abbey Worship Book states, “We owe our very existence as a community to the central Gospel conviction that worship is all that we are and all that we do.” So what did this stone carving have to do with worship? Why was he there? The primary purpose of worship is to facilitate an encounter with God in community. In Matthew 18:20 Jesus says, “For where two or three are gathered in my name I am there among them.” From the very beginning of the Christian church, new believers spent much time together in the temple praising God and being taught by the apostles. Worship has been a primary portal for spiritual formation and instruction throughout Christian history. Before most people could read, worship was where the scriptures were heard, the Word was proclaimed, and stories of faith were taught in stained glass, sculpture, paintings, and illuminated manuscripts. The architecture of cathedrals and abbeys drew people into God’s presence and offered a “sanctuary” where community was formed and the troubles of a harsh world could be left behind, if only for a time. During a subsequent tour of the Iona Abbey I learned the history of the aptly named “Tortured Soul.” Abbey preachers in medieval times were instructed to face the tortured soul when speaking because in this position their voice would project to every corner of the sanctuary. The tortured soul was the first sound system! And we all know how tortuous it is not to be able to hear in church. Life is very different today than in the days of the tortured soul. We don’t need preaching to impart information because the Internet is at our fingertips. We don’t need worship to facilitate a social network because we can find friends anywhere. We don’t even need the church to provide service opportunities because a myriad of social service agencies and non-profits beg for our time and energy. What people are desperate for today is an encounter with God that will empower them to love their neighbor and connect their faith with the world. Unfortunately, data gathered over a five-year period by the Barna Group does not give high marks to churches in this area. According to the 2001 study, nearly half (48%) of regular church attendees had not experienced God’s presence in worship during the previous year. Evidently, millions of tortured souls in our country are not able to connect with God in worship. Worship was listed in the survey as the most important of six foundational faith practices (worship, evangelism, discipleship, fellowship, stewardship, and compassionate service), but a significant percentage of people struggle to experience God in worship. Clearly, Christians desire worship to be a time of spiritual formation. They want to be challenged to grow in faith, hope and love, but it’s not happening consistently. Where’s the disconnect? It’s not on God’s part. God is always fully present in worship and desires more than anything that we become people of faith who offer our very lives in service to God and the world. As God gave us the gift of the life, death, and resurrection of Jesus Christ, so God patiently and passionately unleashes the power of the Holy Spirit every time we gather for worship. If worship is all that we are and all that we do, why don’t we tap into that power? What is it that gets in the way of our encounter with God? At times the disconnect is with those who sit in the pews because they have not adequately prepared for worship. Too often we become the tortured souls on the pillar of the church by rushing into worship without knowing the theme of the service or having read the scripture ahead of time. We have great difficulty letting go of the cares and worries that preoccupy us, refuse to leave our cell phone at home, and even sneak a peek at our email during the offering. We cannot be fully present to God without engaging worship with all of our heart, soul, mind, and strength. When we come receptive to the unpredictability of the Holy Spirit to grab us and take us where we may not want to go, spiritual formation takes place. Even if we arrive with open hands, however, our experience of God can be inhibited if worship does not flow, leaders are not well prepared, and unnecessary distractions are not eliminated. At times we have difficulty encountering God because of the worship experience itself, which has been anecdotally described by some as torture. Do you provide sermon titles, themes, and scriptures on your web site and in newsletters and bulletins so that worshippers can prepare themselves spiritually for the service? Do you offer a time of quiet meditation before worship so that people stop visiting with friends, calm their spirits, and turn their hearts toward God? In a world where there are few noiseless places, we need space to prepare to encounter the holy mystery that is God. Do you take seriously the different ways in which people experience God by offering worship that appeals to all the senses and various learning styles? Does the music reflect the theme of the day and focus on spiritual formation rather than entertainment? Do you plan and execute worship so that Joe is not allowed to hijack 10 minutes in the middle of the service to advertise the chicken BBQ? Do you offer well-crafted prayers that are confessional, reflect an awareness of current events, and move beyond simply naming the sick to embracing the entirety of needs in God’s world? Does your preaching connect the biblical narrative with the hopes and dreams of today’s seekers, encourage wrestling with difficult and timely subjects, offer practical application, and challenge worshippers to respond to God’s call in their lives? Consider yesterday’s worship. Did your worship leaders pray for all those whose lives have been affected by Hurricane Sandy, share how the church is on the scene with disaster relief, and offer an opportunity to respond generously? Did you pray for the presidential election on Tuesday and remind parishioners that Jesus’ commandment to love God and our neighbor as ourselves should inform our voting as well as our everyday living? Did you share the words that John Wesley wrote in his journal on October 6, 1774 in reference to the British Parliamentary elections? I finally figured out why the soul on the pillar of the Iona Abbey is tortured. The soul is tortured because he/she did not meet God in worship. Worshipping souls become tortured when they yearn to make sense of the events of our world from a faith perspective but find only a vacuum. Souls are tortured when leaders fail to connect the everyday heartaches and hopes of worshippers with the good news of a God who walks with us even in the valleys and motivates us to love our neighbor in the midst of mysteries we cannot fully understand. Souls are tortured when difficult questions and doubts are either ignored, given shallow answers, or seen as a lack of faith. May we keep ever before us a vision of all tortured souls who yearn to deepen their walk with God. May we face them directly, listen carefully, speak to their hearts, and provide bread for the journey. This entry was posted in dsblog and tagged encounter, Hurricane Sandy, Iona, presence, sanctuary, soul, vote by Bishop Laurie Haller. Bookmark the permalink. Thanks Laurie. I really appreciate getting your blog.